In my article on my Droid apps, a commenter asked if there was a list of video/tv apps for the Droid because she had just switched to the Droid and missed the VCast video app. Since, the Android Marketplace is a such a mess, I did some research and found all the apps I could to compliment my list of music, audio and radio apps. I was unfamiliar with the VCast app, as I have never had a Verizon phone that could support it, due to my preference for smart phones. I don’t know if any of the apps below actually cover any of the VCast videos, but it gives a diverse selection of videos to watch, mostly for free. I did review a few paid apps, and they are denoted below. There are also a fair number of apps in the Android Marketplace that play back videos stored on the phone and apps to manage your Netflix or home DVR. None of those applications are reviewed below, as these are only content delivery apps. Each of the applications listed below can be downloaded by clicking thru and scanning the QR code with a barcode or QR reader. i Video – A streaming video app that allows you to search, download and record videos. The videos in the app appear to be YouTube or YouTube quality videos and not really worth downloading with the default YouTube and camera apps. Jetflicks – This $1.99 app lets you watch streaming tv channels with a paid subscription to their service. I was not able to review the paid version of the app, but the demo version lets you watch an episode of Futurama or a police drama. I don’t like services that require you to purchase an app then pay for a subscription on top of it, so this app drops severely on my list for it. Mother TED – As mentioned in the audio list because I find TED Talks so inspiring, streaming videos of the inpirational talks from the TED conferences streaming directly to the phone. Previously the only video app on my phone. Movies – Although not strictly a video app, this app by Flixter allows you to view movie trailers, in addition to seeing what movies are coming out and purchasing tickets to them and DVD releases. mSpot Movies – A movie rental service that streams direct to your phone. While the app is free, you pay per rental and have 30 Days to watch it and 24 hours to watch it from the first time you press play. 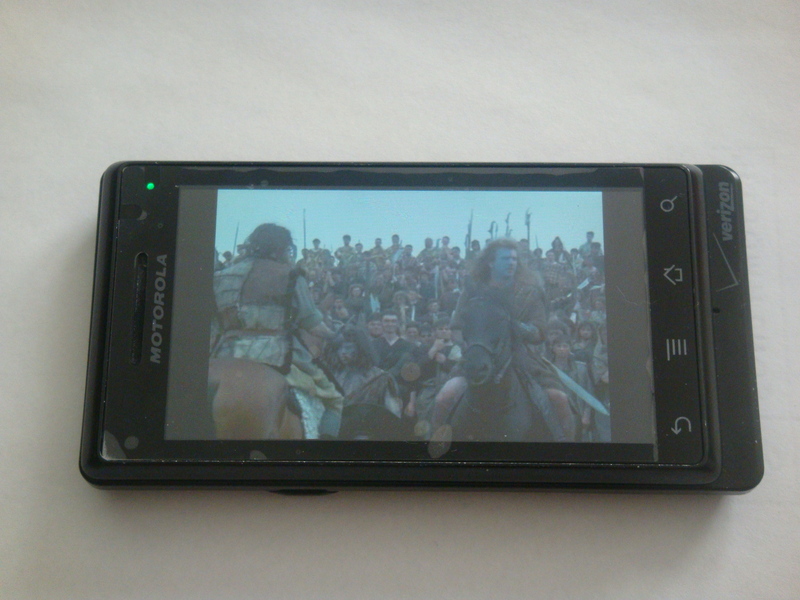 I tested it out with a copy of Braveheart and the video and audio quality were excellent for streaming to mobile. They have an excellent selection of movies that go from black and white classics to recent DVD releases. SPB TV ($10) and SPB TV Lite (Free) – A streaming video app that allows you to watch news, movies and video from around the world. Includes streams from local and national US tv news channels, music channels and older films. Lite version limits you to 6 channels, but the paid version has over 100 to choose from. Of all the video apps I’ve reviewed, the paid version of SPB TV is the best for watching the most diverse and up to date programming. Stream Media Player – The ability to play streaming videos from a preset list or connect to a server of your choice. The video artefacts, audio occasionally stutters and pressing pause doesn’t actually pause the stream. Not really worth downloading. UStream Viewer – Although the app says it is in beta when it starts (at this time) , you can watch your favorite UStream feeds directly and clearly on your phone, so you can watch all the puppy cams you want. This app does not send video, but there is UStream Broadcaster for that. TV.com – Streaming access to clips to CBS and Showtime shows are how the app is promoted, but the real lure is the classic TV shows you can watch. MacGuyver, Beverly Hills 90210 (classic), Twin Peaks, Family Ties, and others to select from make this a worthy app to install. W.Tv – Although I cannot read Chinese, this is a great app for viewing video. you have the option of streaming or downloading any videos on the app. The DVD option in the menu gives you the option to download movies directly to your phone, like purchasing DVDs from a blanket on the streets of New York City. YouTube – It comes preinstalled on the phone with the other Google apps, but it is worth noting that you have access to a world of user contributed videos at your fingertips. ZooTopTen – An app that lets you stream the latest, most popular videos on ZooVision.com directly to your phone. Going to ZooVision.com forced the web browser to download the videos before watching, so this was a more convenient way to handle them. Zooropa also offers individual video apps for anime, like Lady Death, Speed Racer, Twilight: UNBOUND (for Stephanie Meyer fans) and others. While ZooTopTen is free, the individual anime are not. The Android Marketplace makes it hard to find apps if you don’t know what you are looking for, but I find this list of apps give a selection to watch videos, and mostly for free. If I have missed any apps, you think there are better apps than these or you would like a more in depth review of any of these apps, please let me know below. © 2019 JustJon Online. All Rights Reserved.